AUSTIN – Legislation is moving forward that would allow community colleges, such as Navarro College, to apply for accreditation to offer baccalaureate degree programs, including a Bachelor of Science in Nursing. On Wednesday, the House Committee on Higher Education heard testimony on House Bill 1749 filed by third-term lawmaker, Rep. John Wray, R-Waxahachie. With four joint authors and 17 co-authors, the legislation reflects strong bipartisan support. The legislation’s intent is to remove a previous, tiering-based criteria that excluded some community colleges, including Navarro, despite their financial health, ability and constituent request to offer such programs for their students and district. Those testifying in favor of the bill included Dr. Kevin Fagan, president of Navarro College, Cindy Murray, director of nursing at Baylor Scott & White Medical Center – Waxahachie, and Angela Gentry, a Navarro College nursing student. In a previous interview with the Sun, Fegan had shared that Navarro College’s ADN students who want to continue their studies for a bachelor’s degree are faced with a commute or relocation. From Navarro College’s main campus in Corsicana, students would have to travel 81 miles one way to the University of Texas at Arlington, the nearest public university. The nearest private university from Corsicana is Baylor University in Waco, at 58 miles. For Waxahachie-based students, the distance to UTA would be 34 miles, with the distance to Baylor at 70 miles. Within Navarro College’s five-county service area (Navarro, Ellis, Freestone, Leon and Limestone counties), there are no public universities and only one private university, SAGU in Waxahachie. House Bill 1749 removes the $6 billion taxable valuation requirement that prevents junior colleges from even beginning the application process. Currently, 28 of the 50 junior colleges in Texas meet this requirement. HB 1749 allows all Texas junior colleges to apply. If HB 1749 passes, community colleges in Texas, regardless of the size of their taxing district, will be eligible to make their case that they are ready to offer a baccalaureate degree program. This rigorous process includes a review by the Texas Higher Education Coordinating Board, the Southern Association of Colleges and Schools and any overseeing board, and includes numerous financial, academic and other requirements before approval. The next step for HB 1749 is a committee vote to send it before the House of Representatives. If HB 1749 passes the House, it would head to the Texas Senate, where state Sen. Brian Birdwell (R-Granbury) has filed an identical bill (SB 729). Upon passing the House and Senate, it would be sent to the governor’s desk for a signature before becoming law. Navarro College currently offers an associate’s degree in nursing whose recipients are eligible to complete the licensing process to be a registered nurse. Those seeking a bachelor’s degree, however, have to transfer to a university to complete the requirements. Across the nation, there has been a move toward higher degree requirements for registered nurses, with some hospitals requiring a bachelor’s degree to meet their own accreditation standards, according to several reports. Navarro College started its nursing program in 1979, when it began offering licensed vocational nursing courses. It started its registered nurse program in 1982. Since 2000 alone, Navarro’s RN program has graduated 1,410 students, while its LVN program has had 1,346 graduates. The fall 2018 saw more than 900 students declare a pre-BSN major at Navarro, with the RN program admitting about 105 students each year. About 150 LVN students are admitted each year. Navarro College has had a physical presence in Ellis County for 44 years, establishing its Waxahachie campus in 1974 and its Midlothian one in 2006. Navarro College’s only taxing district in its five-county service area is Navarro County. Ellis, Freestone, Leon and Limestone counties are all non-taxing districts. Of the five counties, Ellis is by far the largest, both in population (160,225) and in tax valuation ($13.524 billion). As a whole, the college’s service area has a population of 268,294 and a tax valuation of $24.441 billion. In total, Navarro College serves more than 17,000 students, of which almost 13,000 are enrolled in credit courses, with the remainder in adult education and literacy coursework and continuing education classes. Students enrolled at Navarro represent 110 Texas counties, 37 states and 39 countries. 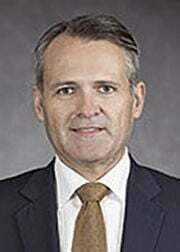 Wray represents House District 10, which includes Ellis County and a part of Henderson County. He serves as vice-chair of the House Committee on Public Health, and is a member of the Calendars and Ways and Means committees. A former councilman and mayor of Waxahachie, Wray practices estate planning and probate law in Ellis County.